The brand name Packard brings to mind the large, luxurious V12 powered automobiles of a bygone era. This Packard does not have a V12, but is equally luxurious, and beautiful. The big V12 cars are expensive, and have a high cost of maintenance. Thankfully, this car features an inline 8, and has a much more reasonable purchase price than many of the large Luxury cars of this style. Priced at $19,000 this is a very nice Packard. Find it here on craigslist out of San Diego, California. 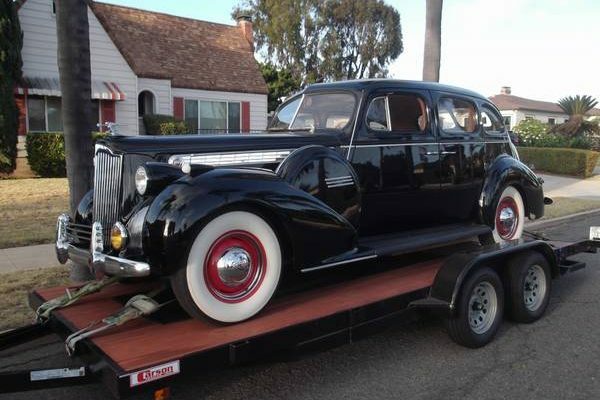 Driving this Packard must truly be an experience all to its own. We would be thrilled to ride in such a car. 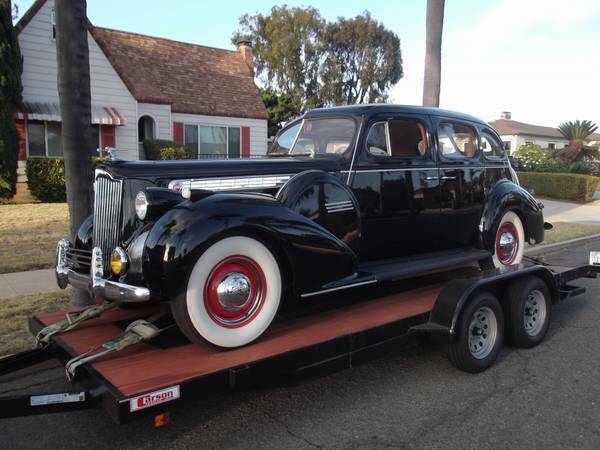 This Packard is a great way to get into a big car with a reasonable price, and the condition is just plain nice. It also has four doors and would gladly haul your family to the local car events. How many of you want to own and drive in the lap of this luxurious big car? 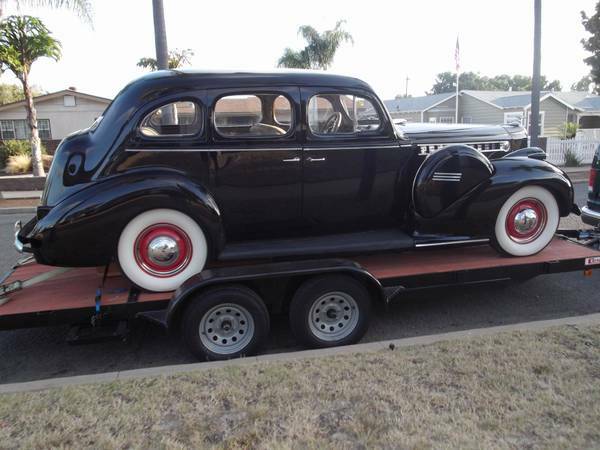 Would you buy this beautiful Packard if you could? Gorgeous. If it was here in OZ at that price, I’d be the new owner. I wouldn’t mind having a car like this but I’d prefer an automatic. 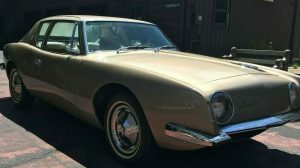 Resto mod? It could be done, I guess, with an automatic, but then you’d be missing the driving experience wthat this car is all about. Automatics had JUST started to come on the market when this car was built and Packard’s didn’t come out until after the war. However keep in mind this is a premium motor car and Packard wanted it to be as nice a driving experience as possible. These cars are VERY easy to shift and with that big, torquey straight 8 it’s not going to need a lot of shifting anyway. When the “easy fix” on a critical component such as the engine has not been done before sale it always puts me in the o go unless the issue can be fixed before sale or the price is adjusted to allow for a complete replacement of the affected component. Agreed. Reminds me of one guy who kept running an ad for months for a pinball machine and he kept saying it just needed a fuse. If that was all that was needed, I never understood why he just didn’t replace it himself. My Dad was born in 1908, he said if you heard Packard, you knew you were out of your league . Very sharp car, but I believe you truly have to understand what owning a Packard at this time meant. You were uptown and everyone else was downtown. It was an elegant experience to drive one. 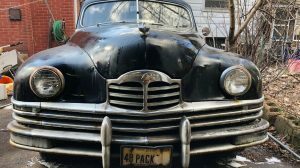 Had a 1940 Hudson as a daily driver. Did most of my own wrenching on the car. Got to know some Packards. The juniors. Parts prices were most all the same. Because the Packard was a better built car, better designed and used better materials it was easier to work on. 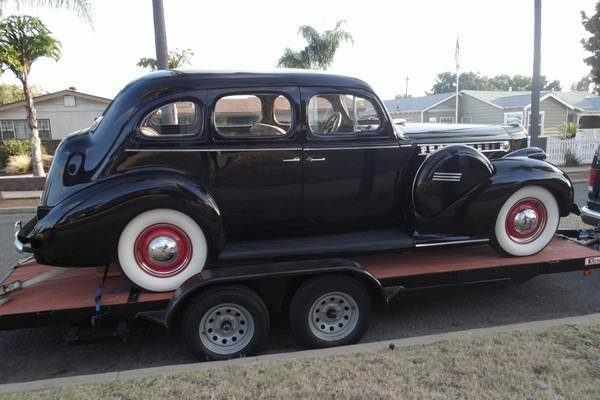 Though I like the looks of some of the other makes of the time, I will be buying another ’38-42 car and it will be a Packard. They can be bought for near the same money as others and are so much better value. After just a few years of ownership my guess is that a Packard will cost you less and be driven more. Just ask the man who has one…..
More accurately, “Ask the man who owns one.” That immortal phrase was originally penned by the grandfather of one of my college roommates and long-time friend. I was mightily impressed when he told me. Hi ccrvtt, that’s cool. That phrase carried them for 50 years, through the war and everything. With today’s cars, the more proper phrase would be, ” Ask the WOMAN that own’s one”. No real need for an automatic. One of these will pull from a very low speed in top gear. Looks like a nice car for the price. Beat up ones don’t go for that much less. Ask the man who owns one. Well I have several and they ride really nice. So nice that my 1 of 1 muscle car and my convertible street rod git sold to buy more packards. I took my wife’s cousin for a spin in my 36 Packard and he told me that it was more comfortable than his wife’s 2012 Nissan. Well, 1st of all, what’s a car like this doing on a trailer? And 2nd, some of you think I’m nuts by saying interest is waning for these magnificent automobiles, but $19g’s,,,for this? It should be $119g’s! I mean, for the price of a rusty GTO ( or whatever) you could have this! IDK, again, while people don’t agree with me,( and that’s ok), but on a recent auction on tv ( I know, say what you will, but it does give an idea where the hobby is going, price wise) a Mid-30’s Packard, very similar to this ( and NO, it wasn’t a Junior, I know my Packards, owning one for 30 years) STRUGGLED to clear $10g’s. Even the moderators were amazed it didn’t go for more. OK, location, time of year, whatever, not long ago, these stately cars were bringing $100g’s, and probably worth it, especially like this. And to be perfectly honest, the way people drive, I’d be afraid to drive this ( maybe that’s why it’s on a trailer) and when I ( rarely) see a car like this, I NEVER see a young person driving it. They’d probably tear the clutch out of it on the test drive. Automatic, sheesh. Tells me a lot right there. Beautiful car, AS IS! Wait, I apologize for the “automatic” remark. Who knows why someone would actually need an automatic, can’t physically operate a stick. I’m sorry. It’s just David is right. An automatic in a car like this would be like sweat pants on a ballerina. Just not right. It probably would mean redoing the whole car. I suppose an “Ultramatic”, ( Packard’s own) could be fitted to the 8, but it wasn’t the best automatic out there. I like this car. Admittedly, I have not watched values of cars of this type, but this seems to be a deal to me. Oingo makes a good point about the “easy fix”, but if it is the carb, the seller may have never worked on one. If I lived on the west coast, I’d be looking seriously at it. Magnificent car. Way out of my league, but I do have a question. 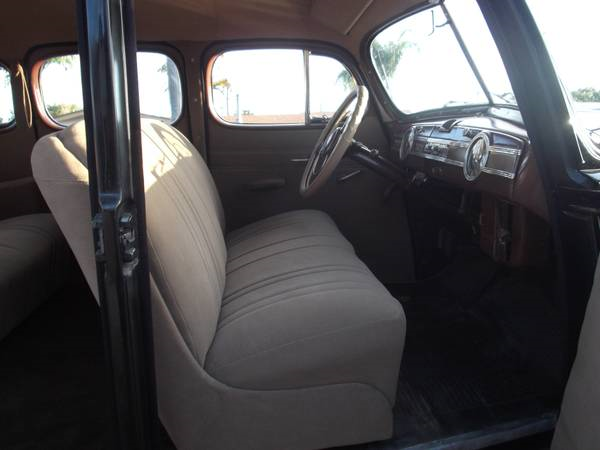 Did cars of this vintage not have exterior rearview mirrors? This is a really nice looking 120 for sure, and they’re actually very easy to drive. This model will have an overdrive at the output end of a very smooth 3-speed, so they are quite capable of 65 MPH cruising speeds. The clutch is big and very forgiving, so no worries about being able to drive it – unless you happen to live on Lombard in SF. But – the 120 was built to be an owner driven top of the line Buick-like car, so having it chaueffer-driven would just be kind of embarrasing, I suspect. 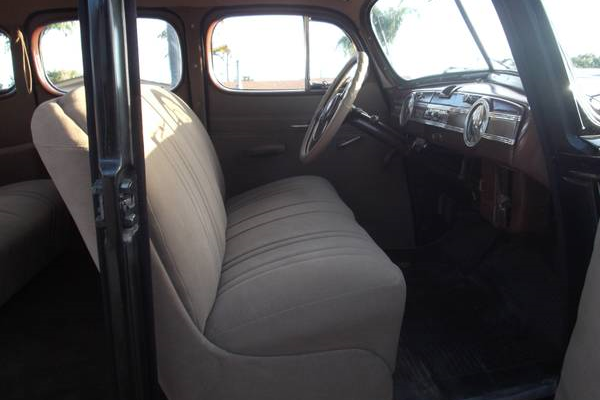 Not all cars came equipped with outside rearview mirrors in 1940, but most buyers added them when ordered. My brother’s 120 has one attached to the driver’s door, clipped over the front edge, but you don’t see much in it! People seemed not to care all that much about what (or who) was behind them back when traffic was SO much lighter. My 34 Packard 12 roadster had a mirror mounted to the top of each sidemount with leather straps, but that car was something else altogether. Rear view mirrors were a luxury. Like Matt sezz, there was nobody behind you and most roads were 2 lane, so no one next to you. When we cleaned out my grandfathers house after he died, we found the receipt for his new 1948 Packard. He had like 3 options on the car. The cormorant hood ornament,( which we still have) a radio, and a side rear view mirror. I remember, the mirror was like $4 dollar accessory. Doesn’t sound like much, but today, that would be a $40 option. ( just for a mirror) That was a lot of money in ’48. Even well into the 60’s the outside rear view mirror was an option. Even into the 80s. Chrysler Corp cars optioned the right mirror. We lived in La Mesa, San Diego county California in 1985. There were two dealerships I was aware of. Carl Burger and another I don’t recall the name. My wife and I went car shopping. All the cars in one lot went without the right rear view mirror. It must have been an additional cost dealer item. The other lot, Carl Burger Dodge had them on all their cars. Very nice. As Howard pointed out, this is not much money for a nice Packard. I wouldn’t change anything. But I think sellers would do themselves a favor if they just spelled out what the fault is (e.g., hard start, gas smell, hesitation, or whatever) rather than speculating (carb? rebuild? replace? ), and letting the potential buyer wonder why, or whether that’s even plausible. Packard at one time was such a profitable car company that more people had stock in Packard then Packard had cars on the road. Mr. Packard’s first car was a Winton. When Mr. Packard complained to Mr. Winton about his car, Mr. Winton told Mr. Packard to go build one himself. The rest is history. 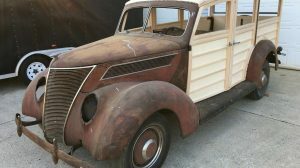 The modern fuel did bad things to my ’40 carb, fuel pump, lines and tank. A number of times I pulled apart the carb and blew out what seemed to be rubber particles that got everywhere. 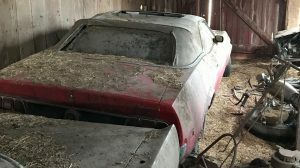 I have known some that felt a carb rebuild should have solved the problem and were ready to throw in the towel when the problem reappeared a year later. This may be the story here. It is an easy fix that he thought he already did and is walking away. Lots of cars in the 30’s and 40’s paid little attention to rear vision. Just look at the Airflow, Tatra, VW, and just basically nobody was anticipating the kind of fast traffic and proliferation of cars we have today. Most tail lights were anemic and brake lights not much better – and when you add vacuum wipers that would virtually stop under accelleration, driving in the rain, at night required plenty of assumptions. ;-) Not to mention signalling. It’s amazing so many people survived!